On January 20, 1942, Reinhard Heydrich, Himmler's second in command of the SS organization, convened a conference in the Berlin suburb of Wannsee. At the meeting, 15 top Nazi bureaucrats and members of the SS met to coordinate the "Final Solution" in which the Nazis would attempt to exterminate the 11 million Jews of Europe and the Soviet Union. The minutes of the conference shown below were taken by Adolf Eichmann, but were personally edited by Heydrich after the meeting, substituting the coded language Nazis often used when referring to lethal actions to be taken against Jews. "...transported to the east," refers to the mass deportations of Jews to ghettos in occupied Poland, then on to the planned gas chamber complexes at Belzec, Sobibor, Treblinka, and Auschwitz. 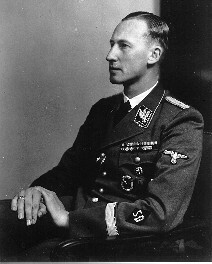 At the beginning of the discussion Chief of the Security Police and of the SD, SS-Obergruppenführer Heydrich, reported that the Reich Marshal had appointed him delegate for the preparations for the final solution of the Jewish question in Europe and pointed out that this discussion had been called for the purpose of clarifying fundamental questions. The wish of the Reich Marshal to have a draft sent to him concerning organizational, factual and material interests in relation to the final solution of the Jewish question in Europe makes necessary an initial common action of all central offices immediately concerned with these questions in order to bring their general activities into line. The Reichsführer-SS and the Chief of the German Police (Chief of the Security Police and the SD) was entrusted with the official central handling of the final solution of the Jewish question without regard to geographic borders.